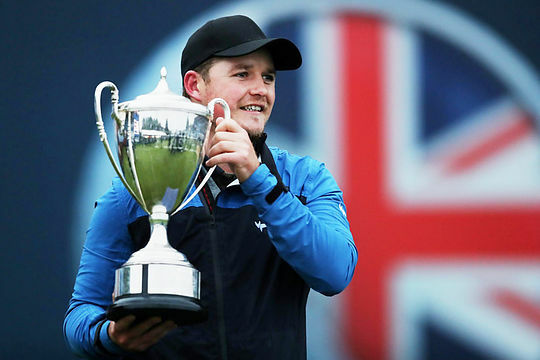 England’s Eddie Pepperell defied miserable conditions to win his second European Tour title of the season in the British Masters and with it a different Masters appearance next April. Pepperell ground out a closing 72 on a wet and windy Walton Heath to complete a wire-to-wire victory on 9-under par, two shots ahead of his playing partner, Alexander Björk from Sweden. Australian Lucas Herbert and Jordan Smith of England finished two shots further back in a share of third. Herbert stormed home across the weekend, firing rounds of 67-69 to finish just four shots behind Pepperell after opening with rounds of 72-75. It’s been a dramatic turn around for Herbert, who less than 12 months ago had no status in Europe but this season has secured six top-10 finishes, including a runners up result at the Portugal Masters, and moved from having begun the year ranked 278th in the world to inside the top-80. From 18 events played so far on the European Tour, Herbert has made the weekend 14 times to currently sit 38th position in the Race to Dubai – the European Tour’s answer to the FedEx Cup. Pepperell was ranked outside the top 500 as recently as May last year, but he won the Qatar Masters in February and followed a runner-up finish in the Scottish Open with a tie for sixth in The Open, propelling him up the world rankings. The win this week is his second European Tour title in 145 starts and moves him into the top-40 in the world rankings at No. 33. Pepperell becomes the fifth multiple winner of the European Tour season, following Matt Wallace (three), Shubhankar Sharma, Francesco Molinari and Brooks Koepka. Wade Ormsby was the next best Australian behind Herbert finishing in a share of 29th position at 1-over. Marcus Fraser was next best at 4-over-par and in a share of 48th position followed by Andrew Dodt in a share of 63rd, Brett Rumford in 68th. Sam Brazel, Jason Norris, Jason Scrivener and Scott Hend did not make the weekend.